I love getting fresh flowers but sadly it doesn't happen too often! It was a real treat for me then when I was given the chance to review a gorgeous bouquet of flowers from Prestige Flower's luxury Valentine's range - lucky me! 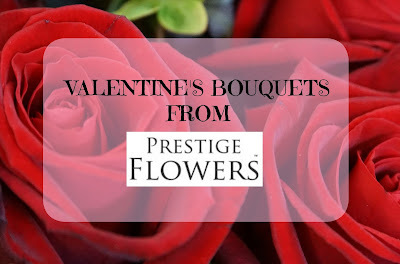 Prestige Flowers are an online florist with a website packed full of beautiful flowers including bouquets for every occasion. They have been voted the number one online florist on ReviewCenter with many many glowing reviews to back this up! I was pleasantly surprised when I took a look at the website, there are some beautiful bouquets on there that won't break the bank. I've always thought that ordering from an online florist would be really expensive but actually it seems better value than visiting a local florist! Plus they deliver 7 days a week which is handy. When my Prestige Flowers Valentines Flowers arrived they were well packaged in a large box, the delivery didn't need signing for either so the driver helpfully left them on my porch. What a lovely surprise to come home to! He was itching to get inside this box!! I was sent the Ti Amo bouquet (£44.99) which as the name suggests, was brimming with romance and passion. 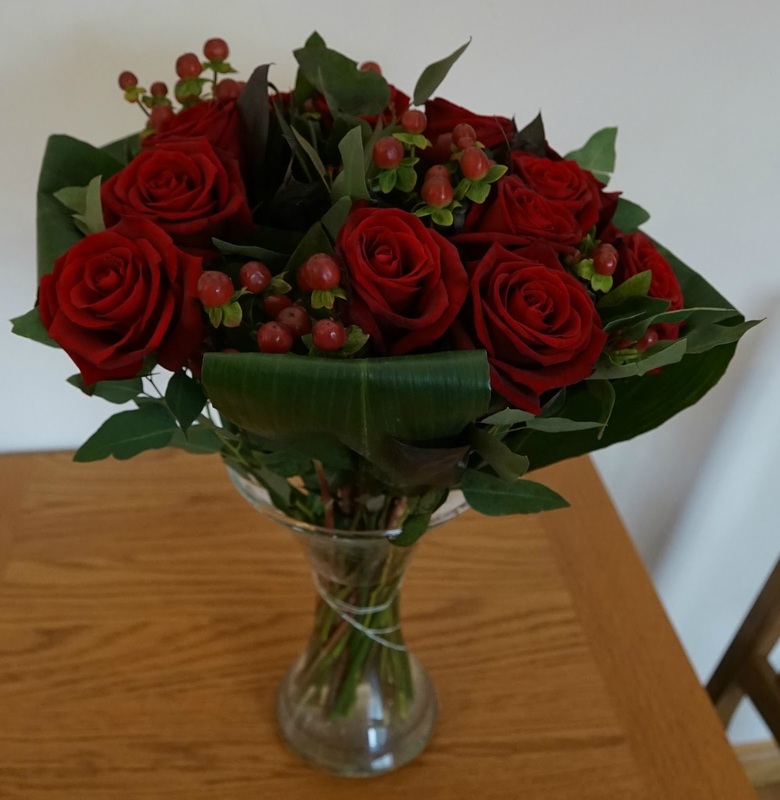 Featuring beautiful long stemmed red roses, hypericum berries in a bed of folded aspidistra leaves, this bouquet was certainly something special. The roses were a gorgeous deep dark red colour and the berries and leaves complimented them perfectly. I don't think I've ever had Valentine's roses before so this was a first for me! The flowers were secured in luxury black wrap and placed in a very nice black gift bag. Also included was a flower care guide booklet and mini box of truffles. He has on occasions. I tend to gift them to family or friends, as though I do like flowers :- I like them in a garden etc, as I do not like to see them die. So if or when I receive flowers I maybe keep them for a day or so, it's nice to see them bloom more. Then I gift them to someone that I know who really enjoys / appreciates cut flowers. That way they get the benefit of them for some time, and it is nice to see the delight on their face. Fiancé now tends to buy me chocolates and sentimental gifts etc. We have some friends and neighbours who have been kind and considerate and we like to express our appreciation. Yes, I usually get a bunch on Valentine's day. Sometimes not all the time! Nope, never. He'd rather overpay the mortgage, the old romantic! Sometimes, I think it depends on how flush he's feeling! No , but I have been given alcohol a few times. No, but I sometimes buy them for myself! I'm single but I love receiving flowers, not only for Valentine's Day. If I bought my wife flowers,she would be very suspicious indeed. We don't celebrate Valentines Day but he does occasionally surprise me with flowers for no particular reason. Never on Valentine's Day, I'm lucky if I get a card. He sometimes gets me them for my birthday but that's about it. No chance. I'm lucky if I get a card! No, but he usually sends me flowers 2 weeks later for our anniversary. He used to. veery year without fail much to my freinds envy. However since having children that's gone out of the window!!! No partner so no flowers for me! No he doesn't, but buys me flowers on special days for us. I don't have a partner so its a big fat no! No, the only time my husband gives me flowers is when they're reduced in the supermarket! no he has never bought me flowers. for a valentine's day but he did 1 for my birthday when i was 17 i'm now coming up to 40, so that just shows you lol. i think to myself sometimes it would be nice to get them on valentine's but i would never tell him that. He always sends me the biggest bunch of flowers! Like the kind you can't even put your hands around...then I have to try and carry them on the train home! no, i've told him books are more romantic lol!! Yes my fiance usually gets me flowers on Valentines day. He used to get me soft toys aslo but I have teddy bears coming out of my ears so I've asked for no more teddy's, lol. My husband buys me flowers from the supermarket! Yes he does but he usually buys flowers and surprises me if I am having a tough day. My husband has bought me flowers in the past, but we no longer have the disposable income for such luxuries. He never does. He usually gets me dvds! I am really spoiled and get flowers every week. He cooks me a lovely meal for Valentines and we often have a weekend away too. Never received flowers for many years, but I am still his Valentine. No flowers for Valentine's Day for me.Have been hoping for the last 15 years! 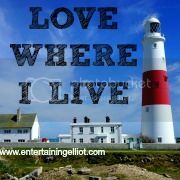 He does when we can afford it :) its hard being self employed but i know he does when he can so thats all that matters! I don't usually buy for Valentine's Day. I'm single so I don't get any flowers! Ha - we don't even celebrate Valentines Day, let alone give gifts, so no flowers for me! Don't have a partner at the moment, but one of my x-bf used to bring me flowers a lot, but on Valentines' Day I got red roses :) We are still good friends now. Never so this would be lovely to win I could pretend!! Sometimes but I usually get a card and other gifts even though he thinks it's really a rip off and you should be thoughtful and kind all year. Nah. We don't really buy into Valentines day. We adore fresh cut flowers and surprise each other with them throughout the year instead. I would give these to my mom, flowers always make her smile. No not anymore he used to get me flowers for most occasions but he tends to forget these days, of well at least he's still loving. No, but I send them to my wife. My other half is more about spontaneous acts of affection. He's sent me flowers because I've had a bad day or because he's seen my favourite flowers and he's just picked them up. No but then neither do I.
sometimes, it depends on whether he remembers or not! He doesn't send them but he does give me flowers usualy very nice ones, so I'm lucky! No he never gets me flowers! Are you kidding?? Nope need to buy them myself!! Sometimes - I always live in hope! No I've never had that! Don't recall the last time I sent or received flowers. It's a shame because they always brighten up a room. Most years he does. Occasionally he will get me something different but I prefer flowers really. He has done in the past, although this year we're skipping valentines day! We're too skint to deal with it this year, lol! Unfortunately not, 31 years and counting!! I'm single haha so noone sends me flowers! Not send - too expensive! - but bring, yes, he does. Can't wait!! No nor a card but we do have a lovely meal and bubbles. Unfortunately my hubby doesn't send me flowers, I might get a bunch of roses from the petrol station though! Hardly ever and if he does they're a cheap bunch from the supermarket, he sees it as a waste of money!! My valentine always buys me an unusual present for Valentine's Day. Last year I got a solid brass crocodile nutcraker!! can you imagine a 'sorry we missed you card' instead of fresh flowers! I've never had flowers sent to me but then again I'm the male, maybe bulbs would do. Anyone know what women get for men on V day?